Triple shower valves are a great way to upgrade as they allow you to create a more luxurious shower. You can operate 2 shower accessories separately or simultaneously for a luxurious experience. Take full command of your shower experience with a triple control shower valve. Each of these triple valves has been manufactured to meet the highest standards and will easily withstand being used on a daily basis. Many have long guarantees. 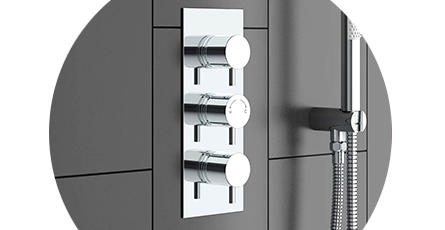 Discover a huge selection of triple shower valves and pick something that will complement the look of your bathroom. Choose from stunning modern and traditional designs. "Good product, value of money." Gorgeous high quality product. This hasn't been installed as yet so unable to comment on how well it works but it certainly looks lovely!